Remember yesterday, when I said I was going to start incorporating other things, like pilates, weights, core, sleep, etc. into my training? Well it started this morning. 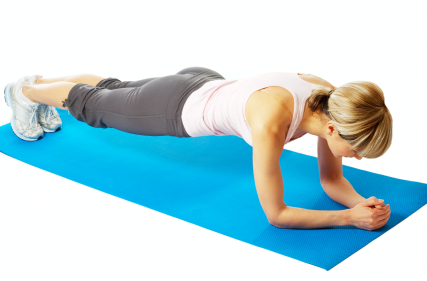 After my morning run I did one plank. Yep, just one. For 60 seconds. It’s harder than it sounds. Go ahead and try it. For 60 real seconds, not counting to 60 super fast. Baby steps. Now, if I could only stop eating 10 Christmas cookies and a glass of red wine a day, and also do a few more planks a day, you might be able to actually see my abs. If i get the nerve I may actually take – and post – a before and after picture of my (lack of) abs and see if progress is made during Lansing training. Stay tuned. Much more peaceful day today, thank goodness! Starting on a New Ending . . .
i was thinking of doing the same thing. but not showing the “before” picture until i have a decent “after” picture 🙂 and planks are no joke!!! Ha! I know, I would only show the before along with a good after picture. If you do it, I’ll do it! Oops, I meant to say that first ab pic. Not a before pic. Heck, if that’s someone’s before I may as well give up!